You can find the rest in his presentation and video. As captivating as his points were, I was impressed with his attitude offstage. I could tell that he lives his values and genuinely wants to share the lessons he’s learned with others. When attendees expressed how much they learned from him, his first response was, “why?” He did not take their comments for granted nor allow themselves to either. He would listen intently to their response but also engage with them to help them learn things about themselves; make them think about their own businesses and verbalize their ideas. His points transcended beyond his slides and excellent public speaking abilities into practice — by encouraging other entrepreneurs to stay focused, listen to their gut and do their best. 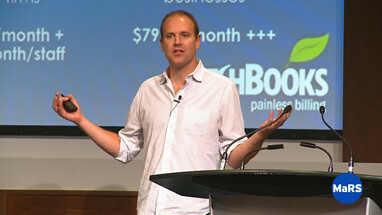 Entrepreneurship 101 2010/11 – Week 3 – Lived It Lecture with Mike McDerment from MaRS Discovery District on Vimeo.